Omni Financial is proud that our team consists of former members and advocates of the military who are committed to “giving back” to the military community. 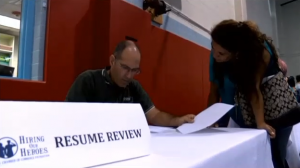 As an example of this commitment, Troy Boudreaux, SFC, USA (Ret), the General Manager of our Omni Financial branch office in Leesville, LA, recently volunteered to review resumes at a Fort Polk MWR job fair. 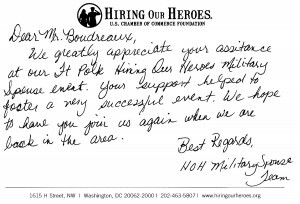 The job fair for military spouses was sponsored by the U.S. Chamber of Commerce Foundation’s Hiring Our Heroes program, a nationwide initiative to help veterans, transitioning service members, and military spouses find meaningful employment opportunities. In addition to running job fairs, the initiative helps with resume preparation, networking, and mentoring, and encourages employers to hire veterans and military spouses. We’ve been in your shoes; we understand that military spouses face many challenges when it comes to employment. Military families move a lot, making it difficult for spouses to attain the work experience employers require. Frequent job changes and lack of experience can be viewed as problematic by employers. Employers can also be reluctant to invest the time and money to train someone who they know will be leaving in a couple of years. Sometimes military spouses may have a state-specific license or certification (such as nursing, child care, or teaching) and are unable to transfer that to a new state. Also, when partners are deployed, the spouses are often unable to work because of the need to take care of children. Sometimes being far away from family who may have been able to help with babysitting and day care can be cost prohibitive. While finding a job can be difficult, there are strategies military spouses can use to increase the chances of getting that all-important interview. If you are a military spouse who is looking for a job, one of those strategies is to have a great resume that highlights your skill set and makes you stand out from the rest. Troy Boudreaux shares some of his best resume tips military spouses should keep in mind. Create a functional resume – A functional resume emphasizes your skills and experience rather than your chronological job history. This can help draw attention away from gaps in your employment history, while keeping the focus on your key strengths and qualifications. Here’s a sample functional resume template. Use professional contact information – If you have an unprofessional-sounding email address (milmomof3@domain.com? ), now is the time to create a professional one using your first and last name. Also, include a phone number (don’t forget the area code) that only you will be able to access. You don’t want to take the chance that your kids will answer the phone. Make sure your voicemail message is clear, professional, and states your name. Avoid military acronyms – Military life is filled with acronyms and jargon but chances are the civilian community won’t understand if you write MWR, PCS, AFB, etc. If you must include them, spell them out first, i.e. Permanent Change of Station (PCS). Research the company – If you are creating or tailoring a resume for a job at a specific company, it is important to do your research. Look at the company’s website, press releases, etc. and be sure that your resume includes key words and industry terminology that they use. You want the hiring manager to quickly be able to see that you understand what they do and that you match their needs. Include volunteer activities – Military spouses are often involved in a myriad of volunteer activities from organizing homecomings to fundraising. These kinds of activities require skills pertaining to leadership, money management, sales, planning, marketing, communications, and more. Be sure to include volunteer work on your resume and focus on the results that will be relevant to your job search. For example: Managed a team of 15 volunteers and raised $25,000 in scholarship funds, an increase of 10% over prior years. There are plenty of online and offline employment resources available for military spouses so be sure to take advantage of them. And don’t forget – as a military spouse you have many unique strengths and qualifications. You can deal with transition and are flexible and resilient – never sell yourself short! These are assets that can easily translate to business and the workforce. 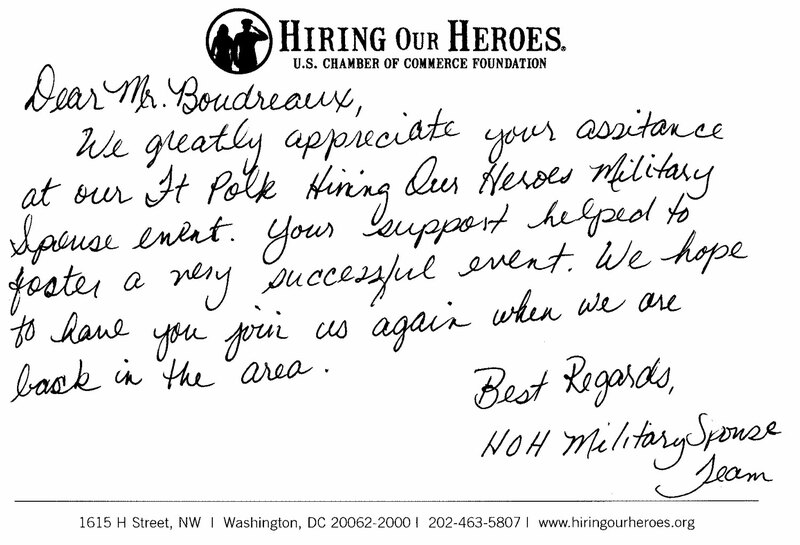 Hiring Our Heroes job fairs are happening all over the country. Click here to find one near you!